Have you wondered why your money sometimes disappears before you even knew where it went? If so, the Bible has an answer for you! It’s because money answers all things. The atoms in gases are careening around at breakneck speed, slamming into each other and bouncing off one another. The atoms in liquids are moving fast, but not uncontrollably like the atoms in gases are. And the atoms in solids are just vibrating next to each other. So even things that don’t seem like they have the ability to act of their own accord actually do. All of a sudden, your neck swivels. Look! There’s a gorgeous turquoise necklace in that display case! (Um, I may or may not be speaking from personal experience here.) 😉 It’s beautiful, and turquoise is one of your favorite stones. You know you shouldn’t spend the money on the necklace, but you ask to look at it anyway … just for fun. You put it around your neck and admire it. It’s so pretty! And the price tag? $70! … and you merrily take that necklace home. I’ll tell you what happened: money did what money does. Money answers things. You walked by that necklace and liked it, and the money in your pocket was looking for something to answer. Yes, I admit this was a story about me. And I also admit that I didn’t have a plan for that money–a.k.a. a budget–before I walked into that store. So the money in my pocket was looking for something to answer, because I hadn’t already given it a job or a name. I had not already told it what to answer. See, I could have told that $70–right after I got paid–that it was going to answer the credit card bill. I could have told it to answer the grocery bill. But I didn’t do any of those things. I left my money crying out for something to answer; so, the first thing I saw that I liked, it answered. Money answers all things. Whatever your need is, money will answer it. But if it hasn’t already answered a need–e.g. your tithe, rent, mortgage payment, electric bill, grocery bill, or savings–then it’s still going to answer something. And that something will inevitably be something you’ll wish later that it hadn’t answered. The solution is simply that, as soon as you receive money, tell it what to answer. Sometimes I have a plan for my personal allowance when I receive it. Sometimes, however, I don’t. And I’ve noticed that, if I don’t have a plan for my personal allowance–if I haven’t told it what to answer–then I usually end up stopping at some random store, seeing something I had NO intention or even thought of buying previously, and deciding I have to have that. If I tell my personal allowance right away what I want it to answer–e.g. a new art supply or saving up for something larger that I want–then you know what? The strangest thing happens. Those dollars just sit right there and behave. I don’t have the urge to spend them. I don’t have random impulses to go to the store. I don’t get sidetracked when I do walk through the store. I just have no urge to spend at all. Because money answers all things. And if I already told that money what to answer, then it’s out of commission. It’s like a chess piece that’s been taken and is now off the board. It answers what I tell it to as soon as I tell it what to answer, and then it’s done. I know that sounds strange, but it’s true. So how can you make your money behave? Tell it what to answer as soon as you receive it. I put the amount in that I started with, assigned each dollar amount to what I had to pay that week, and stopped when I reached zero. It works beautifully and simply, and my money was always answering the right stuff. It helped me radically transform my finances, pay off my credit cards, and build a beginner savings account. What do you need your money to answer today? Download the worksheet, or make one like it for yourself! Then tell your money what to answer, and watch it behave. You’ll be shocked at how those dollars, pounds, won, yen, pesos, or whatever else line up like little toy soldiers, in a perfectly-ordered line. The Word of God is true! And when He tells us that your money is bound and determined to answer something, He gave us both the clue and the brilliant solution all at once. So start telling your money what to answer today! 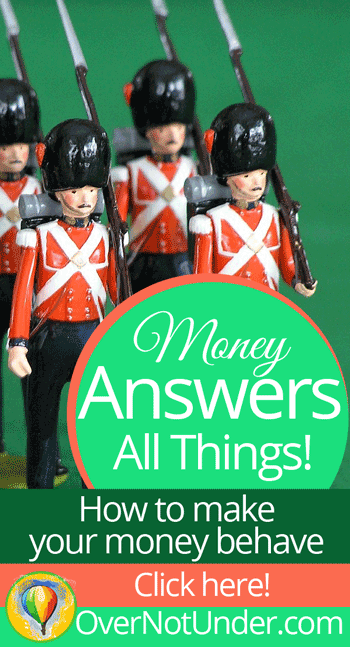 Did you know that your money is swiveling its head around, looking for something to answer? What has your money been answering? What, if anything, will you do to make it answer something different? Leave a comment below! 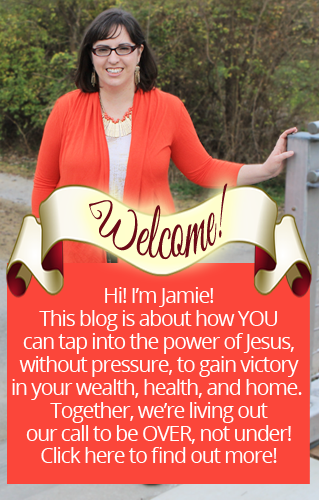 Hi Jamie, I am blessed with this write-up today.Love to learn more. Keep doing what you are doing. 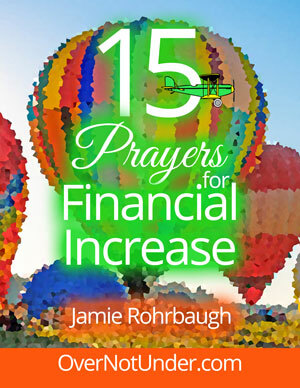 Get 15 Prayers for Financial Increase FREE when you sign up for free email updates!I want in!